The 11. season of the Intel Extreme Masters is coming to its final stage. The last of the 4 tournaments of the current season will be taking place in Katowice, Poland. Besides the Starcraft tournament, there will also be a CS:GO and an LoL-tournament, from the end of February until early March there are two qualifying phases going to be taking place, one online, another offline at the event. The IEM Katowice surely is going to be one of the must-see events of the year for all Starcraft 2 fans, with a price pool of an amazing 250.000 dollars. Make sure to gather all your friends and family, uncles and grandmas in front of the livestream, as the best players of the planet will be spoiling us with top level Starcraft 2: Legacy of the Void action. Until now there is plenty of information missing about the Starcraft 2 players, the schedule and the betting odds. We are keeping this site up to date so you can’t miss out on anything. There are 4 online qualifiers providing for 12 slots at the main tournament group stage. As a next step we have an offline qualifier tournament held directly at the IEM Katowice. 64 players will be distributed into 4 double-elimination-brackets. There are currently no Starcraft 2 betting odds available. At least a couple of days prior to the event, odds will be available at bookmakers like betway, bet365, Pinnalce and others. 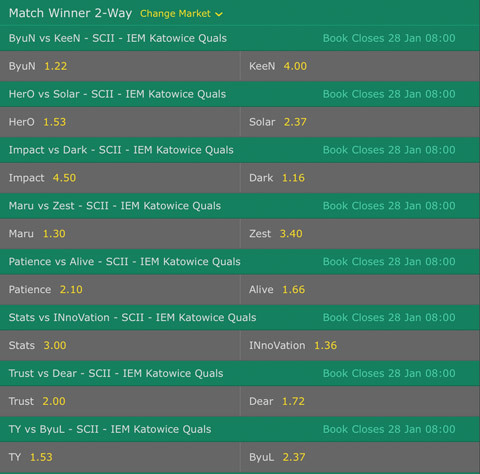 Get more information about Starcraft 2 betting here or find out more about the current bets and odds for the IEM Katowice 2017.